Located in eastern North Carolina, Sampson County is the largest North Carolina county by area, about the size of Rhode Island. It is also the largest agricultural county in North Carolina. The county seat is Clinton. The population in 2010 was 63,431. Sampson’s political history, however, is vastly different from its neighbors. Uniquely of eastern North Carolina counties, Sampson gave strong support to Republican candidates while North Carolina was still in the throes of the Democratic Solid South. This is due to the influence of Marion Butler, an 1890s era politician who became the leader of the Populist movement. The Populist movement was a black-white coalition with highly agrarian interests. The success of the movement led to a “Fusion” legislature in the 1890s and the election of a Republican governor in 1896. But the Populist movement was fraught with internal divisions, and Sampson County would follow Butler into the Republican Party. Sampson County today is much more in line with its neighbors in the coast plain region. Sampson is one of the most racially polarized counties in North Carolina; Mitt Romney won nearly 85% of the white vote here in 2012. The county is also geographically divided between white and black. North and West Sampson County is white and strongly Republican, South and East Sampson County is less white and is where Democrats find most of their support. Democrats still have a majority of County Commissioners. The town of Spiveys Corner in northwest Sampson County is known for being the location of the National Hollering Contest. Hollering was a pastime for farmers in days past when they needed to communicate with neighbors who were often far away. Forecast: In 1988, Sampson nearly went for Michael Dukakis, who did well among agricultural areas in North Carolina and nationwide. Sampson backed Bill Clinton in 1992 but fallout over tobacco policies prompted a Dole win in 1996. Sampson has voted for Republicans for president ever since. With white voters solidly behind Republicans, at the least at the federal level, Republicans continue to do strong in Sampson County. There was a 5.44% growth rate in the county during the 2000s decade. The white population is barely growing, the black population is in decline but there are more blacks registered in Sampson County than ever before thanks to the efforts of OFA. The biggest problem facing Republicans in Sampson County in the near future is the growth of the Hispanic population. Hispanics now compose 16% of the population but lag in voter registration. If Hispanics register in greater numbers and they vote Democrat, then the math becomes very difficult for Republicans in Sampson County. The conventional wisdom that Republicans have maxed out with white voters nationally is wrong, but Republicans really have maxed out with white voters in Sampson County, and the likelihood of increasing this support further is low. Given its relatively small size victory in Sampson County is not essential, but it is an example of the threat a growing Hispanic population has in store for North Carolina Republicans. It is fortunate for them that Hispanic registration and turnout is especially poor in rural counties, which gives Republicans the chance to decide which course of action to pursue in order to address this Hispanic problem in the future. 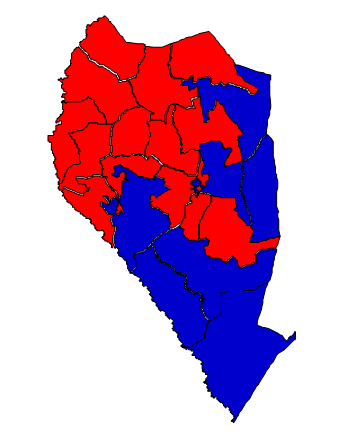 2012 presidential election results in Sampson County (blue = Obama; red = Romney). The precinct map is identical to what it was in 2008.